One of my favorite activities growing up in Northeast Philly was going to the Leo Mall on Bustleton Avenue. While it wasn't as large as, say, Roosevelt Mall, back then it had staples like a bookstore, Sound Odyssey (anyone else wait hours in line to get "Pac-Man" for the Atari 2600?) and a Bassetts Ice Cream stand. As a kid, I didn't appreciate the history of Bassetts, but its ice cream is as much a Philadelphia food tradition as any other. 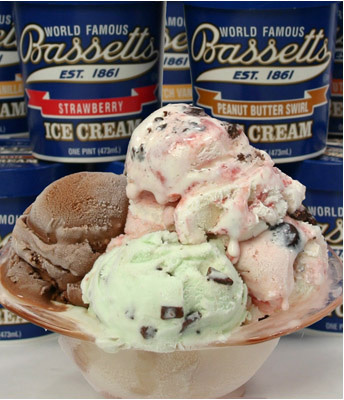 2011 marks the 150th anniversary of Bassetts, which is the country's oldest ice cream company. Its origin dates to 1861, when Lewis Dubois Bassett, a Quaker school teacher and farmer, began making ice cream in his Salem, New Jersey backyard using a mule-turned churn. In 1893, Bassetts opened a still-operating stand at Philadelphia's Reading Terminal Market. Currently, Bassetts is run by fifth-generation descendants of the company's founder. In addition to the stand at Reading Terminal Market, the products are available at area parlors like The Pop Shop in Collingswood and sold by the pint online and at stores such as Whole Foods, McCaffrey's, Weaver's Way and ShopRite markets.